I am a Busy Teacher and BusyTeacher.org saves me time! The idiom package I just downloaded was perfect for my lesson and I didn't have to hunt all over for it! The cat was in the bag at one stop! Thanks BusyTeacher! ... My lesson plans are complete, I'm ready to print them for my administrator, but I know they are not as rich as I want them to be. I need one little dash of splash for them to be spicy enough to hold the attention of my 8th graders. Where do I turn to? Busy Teacher. There is almost always something there for me to grab and add to my arsenal of bright ideas for teaching. I love Busy Teacher. Of all the things I have subscribed to and "liked", this is one I will stick with. The others eventually have been dropped or ignored. BusyTeacher.org is like a cup of coffee on a rainy morning - it fills you with strength and inspiration to go ahead and face the challenge of sharing your knowledge with the others :) but it's not a plastic cup of cheap instant brew, but an elegant mug of hand-picked coffee which gives you all the cards in hand, sets you on the go, and puts the smile on your face when you meet your students for another fascinating lesson! Finding Busyteacher.org has been great! It not only saves time in lesson preparation, it has made teaching even more fun for me, by allowing me to see new ideas and grow in my creativity! I'd been using the same old worksheets for so long, that I forgot what it was like to see some new and exciting ideas! Thanks, Busyteacher! Recipe for a successful lesson: connect to the Internet and type "www.busyteacher.org". Log in. Search for your lesson plan: you're bound to find exactly what you need! Download it, print it out and enjoy! Serve with students, fun guaranteed!!! I love BusyTeacher.org because it's always full of inspirational excercises. When I am out of new ideas, I always come here to find worksheets, games and excercises. Some of them I use directly in my lessons, others I edit to match my students' needs. To sum up, BusyTeacher.org not only saves time but also makes you a better teacher! I am an ESL teacher for young children. I have been using Busy Teacher for a couple of months now and find the resources very helpful in preparing my lessons. I also find that the site also helps in sparking new ideas of my own. It is wonderful to have this material at the tip of your fingertips! Thank you. I use Busy Teacher because it is well organised and helps me save time... I'm a busy teacher ... after all. Great job!!! Congrats! Lucky me I've found Busy Teacher! First of all, I'm really thankful for the website! It's so practical and colorful! Besides, it's possible to find everything! It's amazing how your materials motivate the students! The worksheets are really funny! I've been learning a lot with the materials. It seems like they give me so many roads to follow! Amazing! Keep up the great work! I have been an English teacher for over 15 years all over my country Colombia, teaching all kind of students. I also love tech and spend a lot of time online lokking for resources, and this site has surprised me and helped me a lot with my every day classes. It has great stuff for all levels, I love it. Keep it up and thank you very much! As a volunteer tutor of 3 different levels of ESL I find lots of great ideas and worksheets for my sessions. Rather than searching books and many web sites I can usually find what I need here. What I most benefit from are the teaching articles and/ or tips presented. Even though I have been a teacher for more than 30 years I still benefit from them - they are very refreshing and updated. About the worksheets, well, they have been a lifesaver especially the ones that are grammar topics besides being great for reviewing and/or introducing grammar points they are visually appealing. 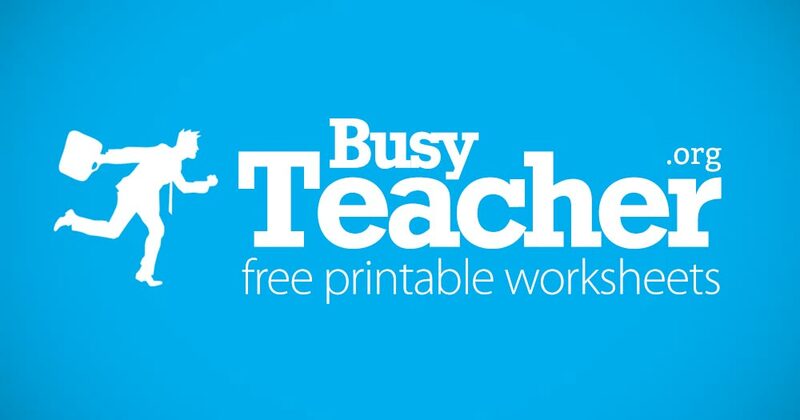 I use Busy Teacher to download worksheets and read ideas for lesson plans and games. There are many useful contributions that help me to enrich my lessons. They really fit my way of teaching.Thank you and keep up the great work! I am an English Teacher from Bern, Switzerland. My English lessons are adapted to people's needs. I don't work with one special course book but use all sorts of resources and original materials according to my students' needs and interestes. Busy Teacher is a good supplement and inspiration for last minute planning. I also like the Facebook postings so I can share them with my students in my *Virtual Classroom* as extra language inputs. Thank you very much for the inspiration and making my life easier (at times)! I'm an Engish coordinator in a private university in Guadalajara, Mexico and I'm developing several EFL courses which are being implemented in regular bachelor's programs, and at Busy Teacher I have found ideas on different activities which have been really helpful. I've also found resources, lesson plans, handouts, etc. that I just have adapted to fit in my groups and teachers. Hey you guys! Being a Spanish speaking teacher I've found your site extremely useful especially the tips on specific grammar points. You know for us, Latin Americans, teaching English is sometimes hard but with the fabulous articles and useful ideas you publish every week, teaching seems like cooking, easy! Thanks to you I feel and am a better teacher. I'm an English teacher from Iran. I'm 22. I really LOVE Busy Teacher, because I am a busy teacher, too! Yes, it saves me time. I count every second to receive the new newsletter. Then I greedily download all the articles, posters and worksheets - I enjoy them this much! I use many of the worksheets in my classes and when I see that my students enjoy doing them, I'm on the seventh heaven! I really thank you. With you,Busy Teacher, I've got much more free time to think why I'm a teacher. Thanks a lot for the worksheets and very interesting posters. I have decorated my classroom with them. My congratulations! I love BusyTeacher.org because I am a busy Malaysian English language teacher!!! Busy but lucky, I am a tech-savvy teacher. I love everything on BusyTeacher.org: from Grammar to Pronunciation. I stumbled upon the website as I was looking for lesson plans and worksheets. It's wonderful too as I can just login with my Facebook account! It saves my time to create worksheets for my every single lesson and of course, it helps me to be a better teacher, as it offers abundance of teaching ideas, warmers, fillers and what not! Plus it's FREE! This is a paradise for busy teacher like me! Thank you BusyTeacher.org - you are AWESOME! Keep it up! What a great website! There are so many handy and useful worksheet to drill a grammar point home! How's that for an expression? When I am making a lesson on a particular topic or grammar point, I turn to your website to reinforce my lesson with extra practice on the topic. I love the variety and detail of the lessons and worksheets found here...way to go, busyteacher.org. Busy Teacher has helped me to realize I still have got A LOT to learn. I have always thought you can learn something every day, but I never thought there were so many things around. I have used several of the ideas in my classes, and they have worked just great! The posters have been a blast with my fellow teachers! They help a lot to cheer us up whenever we have a tough day. We have really enjoyed them. Thanks a lot for helping make every day a lot easier. The washing machine, Internet and BusyTeacher.org: definetely, the new wonders of the modern world!!!!!!! BusyTeacher.org is just like ketchup on my fries. It has made my lessons really tasty. Children love whatever I download and I really really promise to try & produce handouts like those I keep borrowing from you people! Thank you very very much for making my life so much easier and my students soooooo interested! I have always wanted a place where I can just relax and cruise through finding what I need and reflect on what I had already discovered. Busy teacher is like driving with the top down while the breeze blows through my hair on a sunny afternoon. Keep up the good work!